I am a member of the Collective Bias community. This Walmart produce shop has been compensated as part of a social shopper amplification for Collective Bias and its advertiser. All opinions are my own. Having the right breakfast makes all the difference in how our day goes. Usually boxed cereals do not stick around for more than an hour and we find ourselves hungry. I want my family to go off into their day well fed with something healthy that will nourish their bodies. I had an idea to make a baked oatmeal casserole using fresh bananas and Dole Squish'ems. I took a quick late night trip to Walmart to visit their produce section for my ingredients. My husband and children were all fast asleep. I like shopping late at night because it's quiet and peaceful. I am so glad my Walmart is open all night long. The produce section is huge and features a lot of local items. I like that Walmart has a 100% money back guarantee. If you don't like it you get your money back. I browsed through the entire produce section at Walmart. I picked out some bananas for my dish. The bright yellow bananas looked really delicious. I was able to find a bunch that was really ripe, perfect for baking with. I grabbed a bag of spinach for a lunch the next day and then I strolled on over to the applesauce isle to look for the Dole Squish'ems. I found the Dole Squish'ems away from the produce area, tucked away with the other apple sauce pouches. There are three flavors of pouches and my family loves them all. I decided on the Apple Strawberry fruit pouches. I don't know how they do it but the contents of the Squish'ems almost tastes more fresh than actual fresh fruit. Dole really captures that freshness well. Below is my recipe! 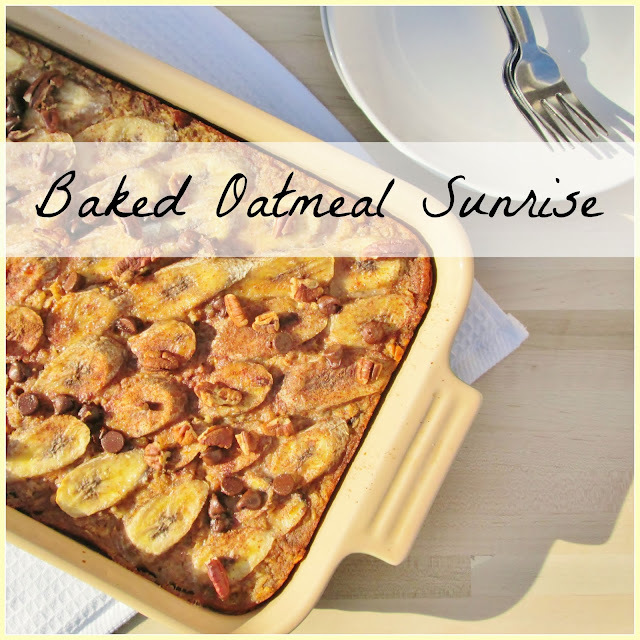 This easy baked oatmeal sunrise casserole is delish served cold or hot. The end result is pure heaven! The strawberry flavor from the Dole Squish'ems shines through. The cinnamon and chocolate plays nicely with the bananas. The casserole firms up and becomes a moist bar. I'd say that my recipe would easily feed 6-8 people. We love #WalmartProduce!